Family Mediation is for separated, separating and divorcing couples. The process is designed to assist a couple negotiate a solution to their dispute, whether it relates to the child arrangements, divorce and/or financial matters. It is a voluntary and confidential process involving an impartial mediator, who is neutral throughout the process. The mediator facilitates communication between the couple, identifying potential and practical solutions, reality-testing proposals made by either person, and providing legal information. Family mediation is not designed to replace legal advice; it is common and strongly encouraged by the mediator that each person obtain independent legal advice outside the mediation process. You can find a solicitor who is committed to dealing with family issues in a constructive way from the Resolution website. A mediator cannot provide legal advice and is not empowered to impose a decision on anyone or make a finding about what may or may not have happened during the relationship. Mediation is future focussed and is not a form of couples counselling. It focuses on the practicalities of separation now and in the future, including the division of assets and sharing the care of any children. More information is set out in my blog Family Mediation – what do you need to know? Clients often choose mediation to find creative and bespoke solutions, and greater control over the separation process compared with what can be achieved in the court process. Clients often feel empowered that they have reached a decision together rather than have a decision imposed on them. Cost – this is known upfront and there are no hidden costs. You pay for face to face meetings and preparation of documents (agreed in advance). It is much more cost effective than litigation, as the clients share the mediator’s costs rather than each paying a solicitor separately. Mediation generally preserves better relationships between former spouses and partners, which is particularly important for future co-parenting, as it avoids potentially acrimonious correspondence between parties’ solicitors. Do you need to make a court application? If you do not wish to try mediation and need to make an application to the court about your children or financial matters, the court requires you to attend a statutory Mediation Information and Assessment Meeting, also known as MIAM. I do not offer this type of meeting and I recommend you contact a FMCA mediator to assist you. You can find a FMCA mediator here. The Mediation Process – where do you begin? The mediation process can be used to discuss all or some of the following issues: separation, divorce, finances and the arrangements for the children. You both decide when to meet, set the agenda, and the pace of each session. To find out more, you can contact me by email or by telephone to set up a no-obligation introductory meeting. If you and your former spouse or partner is interested in the mediation process, then the first step is to invite you both by email to attend a separate introductory meeting. This meeting is an opportunity for me to assess whether mediation is suitable, explain the process, and establish your aims and objectives. By attending the introductory meeting, you are not committing to the mediation process. Once I have met you both individually, assessed that mediation is a suitable process, and everyone is willing to mediate, then we can arrange a first joint meeting. This is when the mediation process officially starts. The first session usually lasts 1.5 hours, although it can be shorter or longer depending on what you both want. Usually, you are both in the same room for the session. However, in some circumstances, shuttle mediation (where you and your spouse or partner are in separate rooms and the mediator goes between the rooms) is appropriate. My role is to manage the process, and help you and your spouse or partner communicate about topics that matter to you both. I provide another perspective, consider both of your aims, and reality test options with you. I am unable to provide advice or give an opinion as to what is in each of your best interests, as this is the role of the lawyer or solicitor. It depends on whether you wish to discuss financial or children matters, or both. There are no fixed number of sessions. The process is flexible. As a guideline, mediation about financial matters involves at least three sessions as it is necessary to have an exchange of financial information with your former partner or spouse. In a similar way to how matrimonial and divorce solicitors work, there is a duty for both of you to provide full and frank financial disclosure in mediation. I will explain the process in more detail in our introductory meeting, and provide you with the relevant forms when mediation begins. If you both reach an agreement, then the mediator drafts the outcome documents, which is usually passed onto one or both sets of solicitors. Separated parents often find it helpful to dedicate one or two sessions to talk about their children and agree how they will communicate in the future especially after a recent separation. Sometimes mediation is needed later when the arrangements start well and then a dispute arises, for example when discussing the division of time during festivals or holidays, or when dealing with a change of school or introducing a new partner to the children. It is always possible to come back to mediation. Sometimes, parents wish to record the arrangements in a parenting plan, which can be drafted by the mediator. I offer a pay as you go service. Most of my clients share the cost of the joint meetings equally but it is decision for you both as to how the costs are met. Joint Meetings £250 per hour (which can be shared at £125 each per hour). Preparation of documents (if required) is charged at my hourly rate, which is discussed with you first. My services do not attract VAT. 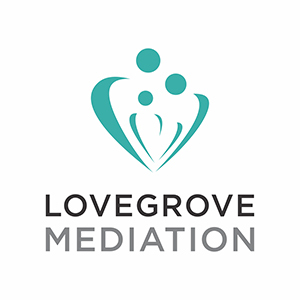 Lovegrove Mediation is a private practice and does not offer Legal Aid for mediation. For further information about Legal Aid, you may wish to contact Kent Family Mediation Service on 01795 410457. You can check whether you are eligible for Legal Aid, using the eligibility calculator here.